My boyfriend and I went to this winery today. The drive up to the winery was beautiful. All the leaves on the trees and vines were yellow, orange and red. Great time to visit wineries at the moment!! The wine estate is huge and absolutely stunning. There is a lake you drive past which gives you a great view of the restauarnt. There is a hotel on the estate, housing, etc. Really is a nice place to drive and walk around. The service at this winery was good. We were seated for our tasting. We got to try 5 wines for R32. We also had a mature cheddar cheese tasting for R18 which included 3, 6, 9 and 12 month old cheese. Other tastings included chocolate and wine for R35, and there was another cheese tasting for R35. 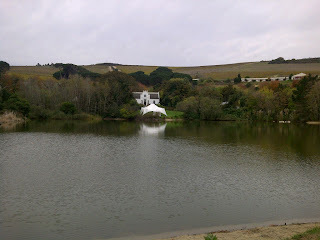 We enjoyed the Sauvignon Blancs, I especially liked the 360 degree SB 2010 for R76. We also liked the Syrah 2007 for R75. The Rose is on special at the moment for R29 for two 375ml bottles. This Rose was actually quite unique. It had a really strong strawberry jam smell and yet an off dry taste. Was quite nice. And for the price, why not :-) The Semillon 2010 is a nice dessert wine. Worth a try. My friends and I went to this winery after visiting three others in the area. One of my friends had suggested this place because they like the vibe, and that it is a nice place to relax and enjoy a bottle of wine. The tasting room is very nice with a funky vibe to it. 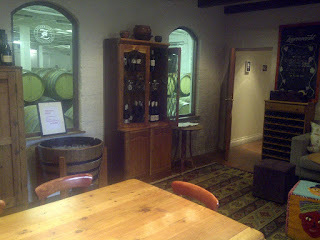 The wine is nicely displayed in the tasting room. As you can see, they have used ribbons on the display wines and are not affraid to use colour. The wine here ranges from R70 for a Sauvignon Blanc to R240 a bottle for the Signature Blend. They have two Sauvigon Blancs, they are both very nice!! The SB 2009 (R85) I found was fruity and smooth. The Signature SB 209 (R115) was more rounded, smooth, and less fruity tasting. The outdoor section is very nice, the atmosphere is relaxed and enjoyable. I was the only one to do a tasting in my group (the rest bought a bottle of wine instead), and the lady was really kind to allow me to do the tasting outside. Be sure to check out this winery when out this way, it truly is a nice place to visit and a great place to enjoy a bottle of wine with friends. Haskell is in the same area as Bilton and Rust en Vrede (within a 5 minute drive), so if you are out this way, you should definitely come to this winery also. This was the third winery on our list for the day and was very lovely. We booked ahead to do a wine tasting here, and it was a really nice experience. We sat at a big table near the windows which allowed us a great view of outside whilst being indoors. The very cool thing about this winery is that they have Australian, New Zealand and South African wine. I was naturally very excited to try the wine here. Some of the wine they stock from NZ is from Craggy Range winery in the Hawkes Bay, which I have visited. This is a stunning winery (you should definitely visit it if in NZ), however, I am not a fan of their wines. In comparison to other NZ wines, this would not be the ideal representation of NZ wines in my opinion. We had a very nice tasting here nonetheless. The NZ 2009 Wild Rock Sauvignon Blanc (R130) was nice, but it doesn't have the passionfruit flavours which I like in the NZ Sauvignon Blancs. The Wild Rock Syrah 2006 (R160) was smooth yet a little dry on the palate. The Australian 2006 Pirathon (by Kalleske - R235) was very nice. It was matured in french oak for two years. It is smooth, a little dry, has a smokey and earthy taste. The Haskell Pillars Syrah 2008 (R400) was a little dry, but had a very nice taste and aftertaste. The Haskell Aeon Syrah 2008 (R290) which is 95% Shiraz and 5% Mouvedre was smooth, nice flavoured, more robust and flavoursome than the Pillars Shiraz, with a slightly dry aftertaste. We all liked this one more than the Pillars. Though both were nice. Out of all the wines, we all loved the Australian Pirathon the most. The service here was great, the guy who served us was really informative and friendly. We all enjoyed the wine tasting here. I hope that my comments about the wines do not come across as a little harsh, as the wines were actually very nice, and I do believe are worth trying out!! On that note, the guy who does the wine tasting selects different wines for the tasting each week. I would be very keen to go again to try some of the other wines. We had a lunch here at Haskell also. It was lovely!!! The views were fantastic, and the food was just as great!! I had the lamb phyllo pastry special and it was awesome!!! Absolutely delicious!!! Everyone enjoyed their meal and all agreed it was worth the visit for the wine, food and scenery. Be sure to come here if you have the chance. 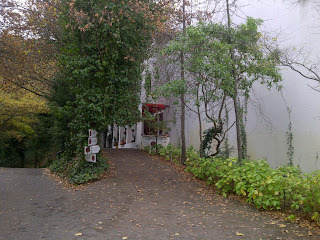 Rust En Vrede was the second winery we visited in the day. It is a very short drive from Bilton and Haskell. Therefore, to visit these three wineries in the same day is ideal. The staff were very friendly and the setting was very nice. You can do a tasting outside or inside. As it was such a beautiful day we chose to do our tasting outside under the trees. The scenery is stunning here, and very much worth visiting. 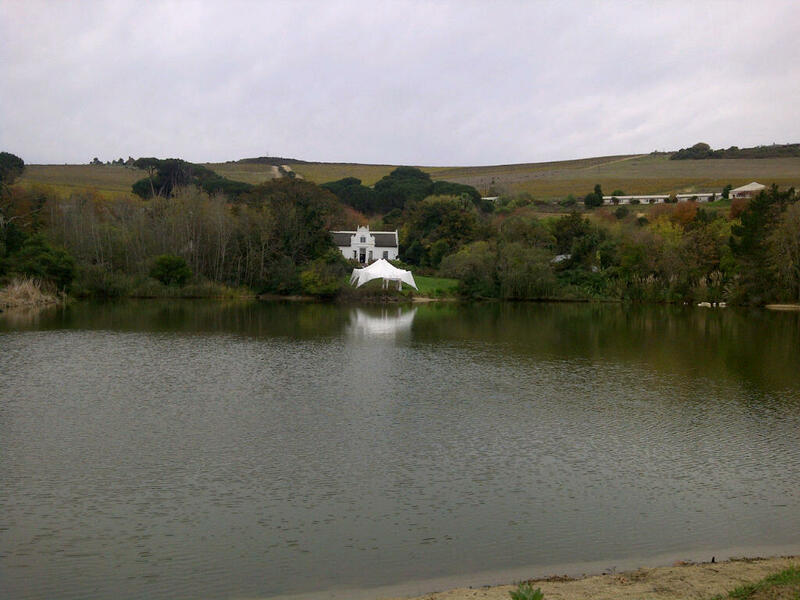 This is the view from the lawn at Vrede en Lust. Stunning views!! Most of the group did the standard wine tasting which cost R40 for four wines. The limited edition tasting cost R30 and that is for two wines. If you try all 6 wines it costs R70. One of my favourite wines here was the Rust en Vrede 2008 Shiraz (R180). It was smooth and very nice to drink. The Rust en Vrede limited edition 2008 Syrah (R850) was quite dry, but had great volume and a nice berry flavour to it. This was a favourite amongst the majority of our group. The other limited edition wine was the 2007 1694 Classification (R1200). This is a blend of 60% Shiraz and 40% Cabernet Sauvignon. It's a very mature tasting wine, is smooth on the palate, yet has a slightly dry after taste. This wine can age up to 20 years. We all enjoyed our visit to this winery. The wine was nice, service was good and the views were worth the visit alone. Be sure to come here if you are in the area. Bilton winery was the first of three wineries we went to on Saturday. All of us were so happy and satisfied with our experience here. Was a great start to the day. I loved the drive to this winery. It was so picturesque. Especially with the leaves on the vines changing colour. It was absolutely beautiful. Bilton, Haskell and Rust en Vrede are in the same area (within 5 minutes drive of each other), so if you have a day to enjoy a few wineries, these three are a good choice. The wine cellar is really nice. It has great staff, nice wines and warm decor!! I loved the feeling I got when I walked in to this place. From the moment we walked in the door, the staff were really friendly and so welcoming!! Great start to the day :-) The guy that served us was fantastic!! Every one in my group liked him and thought he was the best out of all the people who served us that day. He knew the wines really well, was really attentative and was so kind to let us try a few more wines which were not included in the chocolate and wine tasting. We were booked for a chocolate/wine tasting, and it was fab!! Majority of us found the wines improved with the chocolate. I really recommend coming for the chocolate/wine tasting. They only had one white wine for tasting, which was a 2010 Sauvignon Blanc (R65). It was nice, but not to my liking. Its quite fruity though, it has a really strong guava taste to it! It is a rounded and soft SB. Maybe with food, this SB would work well. The 2007 Merlot (R130) had a mixed review in my group. It was not how I expect a merlot to be. Usually I find them soft, easy to drink, and rounded. Whereas I found this was a little dry. It went very nicely with the chocolate. The 2006 Cabernet Sauvignon (R120) was very nice, and we all agreed it would go great with food. It was lighter than most Cab Sauv's and it was quite easy drinking. The 2006 Shiraz (R120) was dry, but went really well with the chocolate!!! It has nice volume, great flavour and would also go very nice with food. It is quite a robust red wine. All the chocolates matched the wines really nicely, and I would definitely recommend people book ahead and definitely do a wine and chocolate tasting. It's great value for money, only R50!! A normal tasting (wine without the chocolate) is R35. Spend the extra R15, it's worth it. The guy serving us was really kind to allow us to try three other wines, on top of the wine we had already had with the chocolate. These included the Matt Black (R95), this was a little dry, and had a nice plum taste to it. Quite a few in the group liked this wine. The Pinotage (R100) was most definitely my favourite!! It had great volume, was rounded (not dry) and had an awesome smell to it. Be sure to try this wine!! Last of all, we tried the flagship wine, Sir Percy (R170). This is a mix of Cab Sauv, Merlot and Petit Verdot. A few in the group liked this wine also. I highly recommend visiting this winery and doing a chocolate and wine tasting.